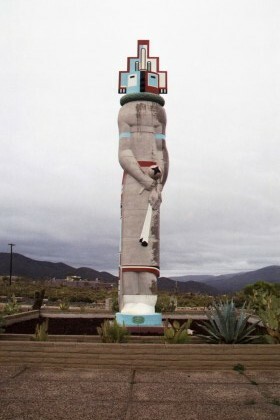 The World's Largest Kachina sits outside of a residential development that seems just like every other residential development. 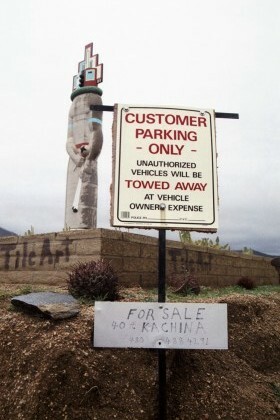 When there, I noticed a small sign that said “For Sale - 40 Ft. Kachina” followed by a phone number. Naturally curious, I called while in Phoenix waiting for a friend to arrive at the airport. The seller had a great story - the gist is, the development wants to force him out. He owns the store front and the Kachina, they want immenant domain. His asking price ($400,000) is mostly to cover his legal fees, and to spite the subdivision with all the homeowners rules and business tactics designed to push out the original people who developed the area.